Back when we were looking at layout blocks done with pencil and paper, I explained that the outer rectangle we were designing within was the containing block. In print design, the containing block is a physical object like a business card or a billboard. On the Web, our container is the browser window. Should the design fill the browser window, or should it have a set width? This decision is one that has plagued web designers for hundreds, if not thousands of yearsâ€”all the way back to the days when we used tables and spacer.gif files to lay out web page content. Okay, maybe not thousands of years ago, but this is a long-standing debate nonetheless. A fluid or liquid layout is designed with percentage-based widths, so that the container stretches when you resize the browser window. These take more thought to plan, as you have to foresee problems that might occur at every possible width. Sometimes pixel-width columns are mixed with percentage-based columns in a fluid layout, but the idea is to show the user as much horizontal content as will fit on their screen. 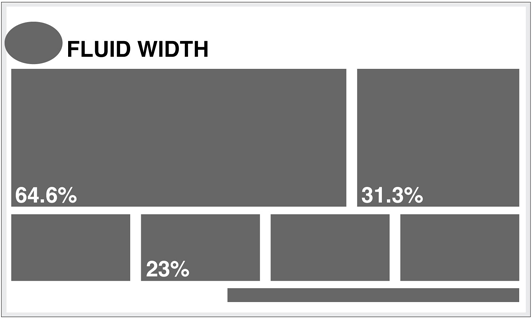 Typically, fluid layouts take advantage of the min-width and max-width properties of CSS, ensuring the container doesnâ€™t become ridiculously narrow or wide. 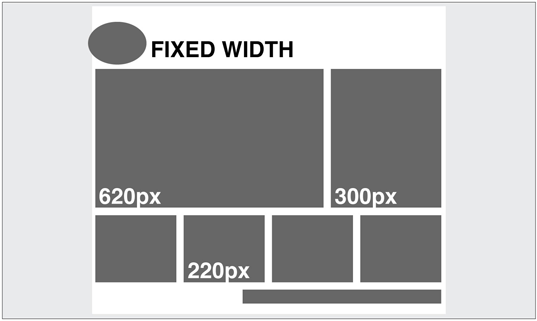 With these pros and cons in mind, Iâ€™ve designed more fixed-width layouts than liquid. I like having control over how the content will display, and working with the background space. On the flip side, I sometimes enjoy the challenges that liquid layouts bring to the table. But, regardless of personal preferences, itâ€™s important to put the needs of your client first. If youâ€™re deciding on the width of a fixed-width layout, you have to think about the audience for which youâ€™re designing, and create a layout that meets the needs of those users. Itâ€™s been said that for every rule, thereâ€™s an exception. Thatâ€™s usually true in the web world, and designers have come up with many variants and hybrids of fixed-width and fluid-width layout structures. Iâ€™ve seen articles recently that list up to ten different layout types. For the purpose of this chapter, however, most of those could be categorized as either fixed or fluid. On A List Apart article, though, introduced a novel layout type that I think weâ€™ll be seeing a lot more of. The article was titled â€œResponsive Web Designâ€� and it was written by Ethan Marcotte. Rather than repeat the entire article here, I highly recommend that you check it out. If I had to name this layout technique myself, I would call it the Omnipotent Mercury Morphing Methodology, but thatâ€™s probably why I didnâ€™t come up with it. The idea is that as the mobile market makes browser window widths more and more inconsistent, the need for our layouts to be fluid and adapt to different widths is increasingly vital. The technique takes advantage of some fancy fluid scaling and CSS3 media queries to completely change the layout as it hits certain width thresholds. 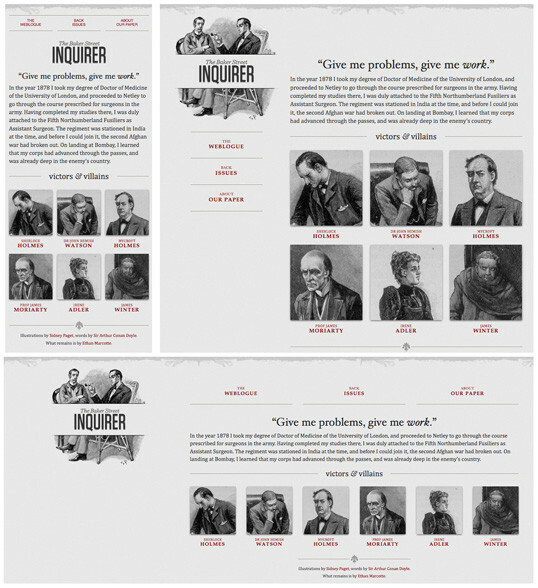 The graphic below shows screenshots of Ethanâ€™s example at three different browser widths. Ethanâ€™s responsive web design (or Omnipotent Mercury Morphing Methodology) is a great solution to a problem weâ€™ve yet to discuss: screen resolutions, which weâ€™ll look at next. This article is from Jason Beaird’s The Principles of Beautiful Web Design book (the second edition of which is out now). This is the eleventh part of the first chapter.